I really love how this is coming along. 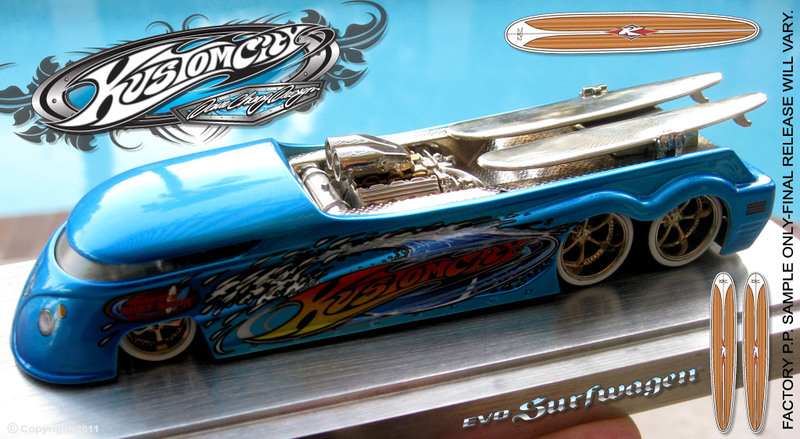 The 5th generation tooling of Evo’s, from engineering files to prototype resin and model shop handmade samples. The 3 pics below are just one of the many steps it takes to get these engineered correctly. 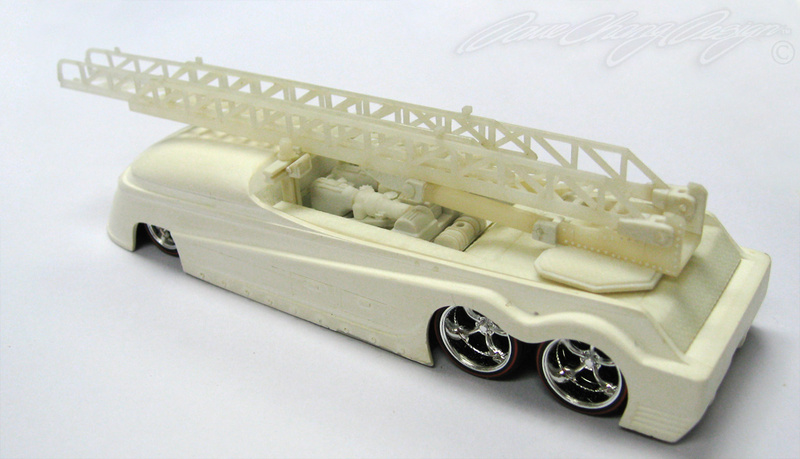 This rear mount fire truck’s ladder does extend and spins. The ladder has been re-done again to make it less taller from the side view. Plus, there was also a 3 ladder version that was scraped. I think you guys will love how this will turn out. Let me know what you guys think, thanks again, Dave. Hot Pink PhotoRealism!?! Over 400+ re-shares on Facebook in less than a month sez something about Felipe’s skillz and vision! So how ’bout them Surfwagens? Check out the latest samples of the surfboards! They are the coolest little surfboards on the planet! I’m here at the factory in China and I’m prepared to haul these back to the States in my carry-on! j/k. 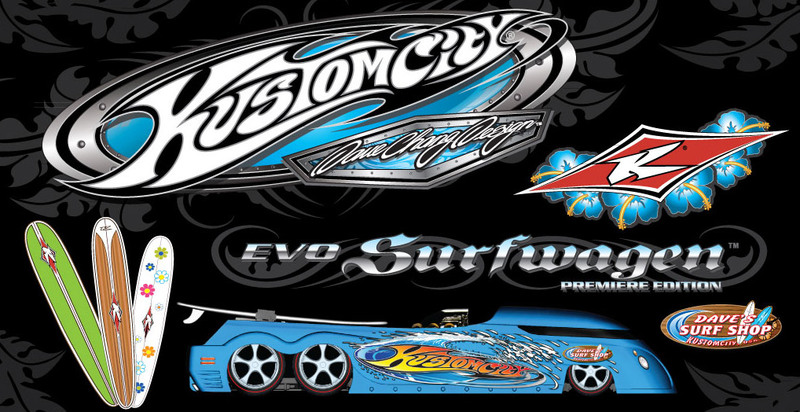 Our schedule is on track for this premiere release of the Surfwagens. Final approvals have been made and the assembly will take place in the next few days, then the shipment will be expre$$ air to our warehouse. With new tools and constant changes to get the best quality for our new release, I’m ecstatic that it’s finally here! Above is your Surfwagen shipping box proofs. It turned out pretty sharp! but wow, them surfboards are clean and tight! Very authentic in this tiny scale. That was the goal: getting away from that cheap plastic looking toy boards. The “Over-Chrome” Hot Pink sample (even at this stage, this is not the final version) Just a few minor changes and QC. Above: Our “Featured Edition” 1/888 in Satin Black. 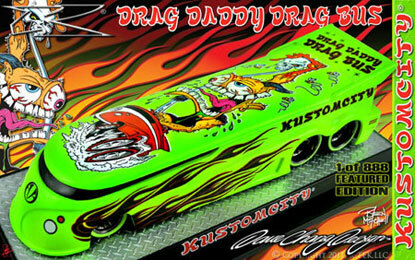 Features a great paint and deco scheme, cool graphics and rides on our “Hub” style wheels with a new rim deco! 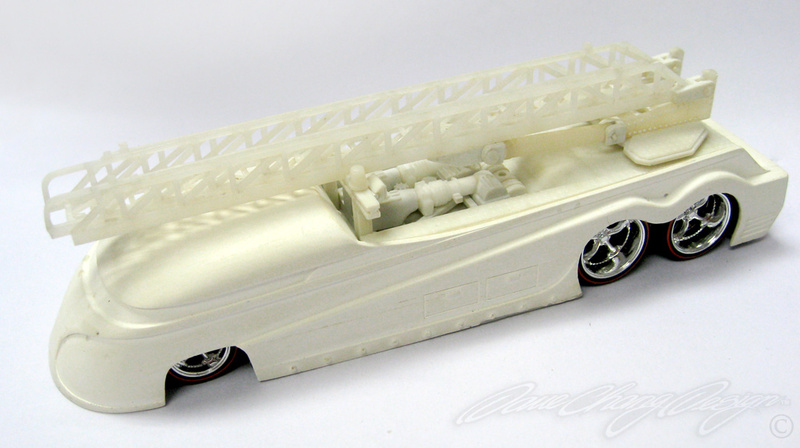 Above: Our 2nd “Featured Edition” 1/888 inFlourescent Green. 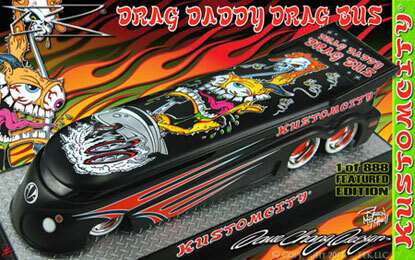 This Edition features some cool wheels and tire decoration. Our 10 spoke rims with “Black Chrome Dip” VUM treatment. Looks Hot! 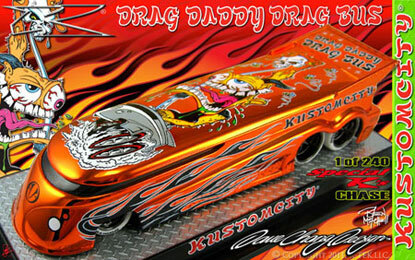 Above: Over-Chrome Orange: 1 of 240 (Special “K” Chase Edition.) One of our new colors and it is gorgeous! 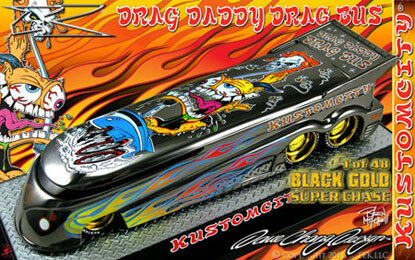 It too also “Black Chrome Dip” VUM wheels with the 6 spoke design & white rubber tires! 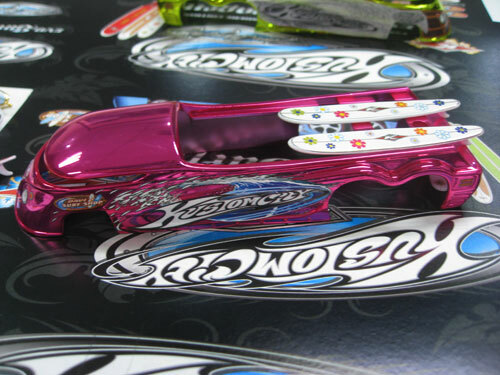 Above: Over-Chrome Hot Pink: 1 of 240 (Special “K” Chase Edition.) 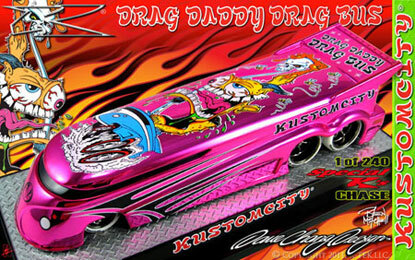 Our Hot Pink “Over-Chrome” returns again! Who don’t like Chrome Hot Pink in die cast? Above: “Black Gold” in Black Chrome: 1 of 48 (Super Chase.) This is the “Black Chrome” treatment for our coveted trademark “Black Golds” This Edition features a yellow to red gradient flame design and limited to only 48 produced. Above: “24K’s” in 24kt Gold Plating: 1 of 48 (Super Chase.) 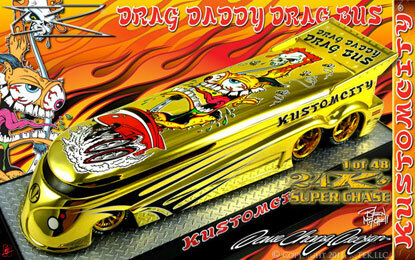 Another favorites is our “24K’s”, another “Super Chase” with gold 10 spoke rim design! 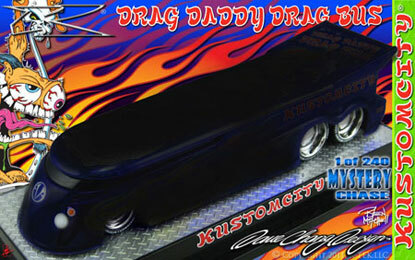 “HAPPY HOLIDAZE” SERIES: 18th ISSUE KUSTOMCITY® EVO GT DRAG BUS! 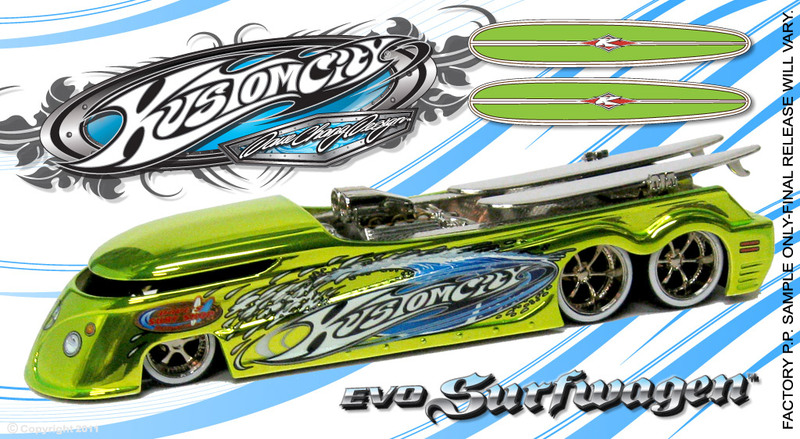 Contest: Building the “World’s Fastest” Downhill EVO!! EVO BIG TOW: The Making of the Brass Master!